The Epson XP-235 printer is an all-in-one color inkjet printer. This printer is a budget printer and is ideal for students and home users. It consumes Epson XP-235 Ink Cartridges. On purchase of the printer, you will get a set of installer cartridges with the package. The Epson XP-235 all-in-one printer weighs 4.1 kgs. The width, depth and height of this printer are 390mm, 300 mm and 145 mm respectively. The printer is easy to handle. The Epson XP-235 printer is known for its smart and neat design. It has a Contact Image Sensor flatbed scanner, commonly known as CIS scanner. It has a control panel of LED light indicators with two indicators for the wireless link. Along with the wireless printing option, the printer also has a USB cable slot situated at the back. The printer is programmed to work on OS X and WIndows both. The Epson XP-235 printer offers a speed of 7.7 ppm for black and white printouts and 1.1 ppm for a color graphic printout. The print speed for a photo is however slightly slow. The printer offers good print quality. You can purchase the Epson XP-235 Ink Cartridges online once the installer cartridges are over. 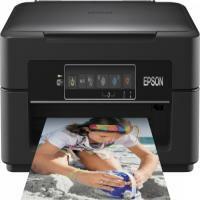 It offers a print head resolution of 5760 dpi and a scan resolution of 1200 X 2400 ppi. The maximum paper size that can be fed to the printer is A4. Though the Epson XP-235 printer is a budget printer and offers some interesting feature to go with it, it offer slow print speed. The absence of a photo card reader makes it difficult to print photos directly from a camera card. The wireless connection is a good feature that allows the printer to be used from anywhere in the house. It is perfect for small spaces. What are the steps to be followed if the print quality of Epson XP-235 is poor? One might face some issues like blurry prints, banding, missing colours of the printouts etc, when the Epson Expression series printer has blocked printhead nozzles or because of the dried out Epson Expression XP-235 ink cartridges. Whichever the cause is, the print quality issue can be resolved by following some easy steps. In case the Epson Status Monitor 3 is disabled access the printer driver, click extended settings on the maintenance tab and then enable Epson Status Monitor 3. The composite black ink is slightly different than the black ink and the printing speed is slowed down. Disable this feature; Select this to continue using black ink. This window is not displayed until you replace the black ink cartridge & it runs low again. Q. How to check the ink level of the Epson XP-235 Ink Cartridges in the Epson printer? A. Epson enables you to check the ink level of the cartridges through the printer driver properties from a desktop using the Epson status monitor. It is always advisable to check the ink levels before printing to ensure consistent quality printouts. Q. Can I use this printer for mobile printing? A. Whether using a smartphone or tablet, the iPrint app can be downloaded to a range of devices for truly wireless printing and scanning purposes. The possibilities don’t end here, with the Epson email print, it is possible to print from anywhere in the world by simply emailing documents and photos directly to the printer. Q. What paper sizes are supported by Epson XP-235 printer? A. The paper sizes like A3, Letter, A4, 2L, KG, L, Postcard, Letter, Business Card Depends upon how the user uses it for printing. Q. Will a remanufactured Epson XP-235 Ink Cartridge void my printer warranty? A. Using a compatible printer cartridge does not affect the warranty unless failure or damage is attributable to it. Keep in mind that the ink should not come into contact with any part of the printer or its internal parts other than the cartridge itself and the print head. The ink must be applied to the paper as the paper is fed through the printer. One must only use high-quality Epson XP-235 Ink Cartridges and rigid remanufacturing processes that will not cause any damage to your printer. Q. How many times can an Epson XP-235 Ink Cartridge be refilled? A. This depends upon the cartridge itself. Many cartridges can be filled 3 to 4 times while others up to 10+ times. We recommend instead of refilling the cartridges one must buy the compatible ones from this site. As refilling the cartridges from time to time might void the printer’s print quality. Q. I need to take ample number of printouts throughout the day at work. I have been given an Epson XP-235 printer for that. Would compatible Epson XP-235 ink cartridges be better than original ink cartridges? A. Absolutely. Since you have to print enormously all the time, compatible ink cartridges are all the more desirable for you. Unlike original ink cartridges, they cost very less and yet provide the same good quality results you can count on. Q. How many pages does the black Epson XP-235 ink cartridge (EPSON 29XL) print? A. A single black EPSON 29XL ink cartridge prints 470 pages . Q. Can I know the quantity of ink in colour Epson XP-235 ink cartridges? A. Each colour ink cartridge in EPSON 29XL holds 13ml of ink. Q. Is it ok if I mix original and compatible ink cartridges in my Epson XP-235 printer, as in, original black ink cartridge and compatible colour ink cartridges? A. No, please avoid mixing original and compatible ink cartridges to avoid complications. Q. I took Epson XP-235 ink cartridges out of the printer even though didn’t have to replace them a few times earlier. Can it cause damage to the printer or cartridges? A. You need to avoid taking out ink cartridges if they don’t have to be replaced. Removing them frequently raises possibilities of decrease in the ink quantity. Q. I’d purchased compatible EPSON 29XL three months back after checking the current ink cartridges closely, I realised that I don’t need to use them right away. For how long can I store these cartridges safely? A. Once the ink cartridges have been opened, they should be installed in the printer as early as possible. Also, they are best used within six months as it will minimise chances of any kind of problem to them and consequently, wastage of money. Q. I’m not very fluent at installing ink cartridges; I usually need to attempt at least twice before I get it right. Will my printer get damaged? A. Yes, there are chances of getting printer damaged if ink cartridges are not installed properly. You need to be attentive and focus on minimising errors. Watch out for signs such as cartridges not clicking the way they should at the time of installation. Q. I’ve been facing the cartridge not recognised error while installing the Epson XP-235 ink cartridges. Why is it happening and what should I do? If you want to install only one ink cartridge, then turn off the printer, take out all the cartridges and install all of them before you turn the printer on. When you turn the printer off, the printer’s memory is erased, which makes it read all the cartridges being fresh and new. If you want to install a new set of cartridges, then start with rebooting the printer once and then installing the ink cartridges one by one. It will get the printer to recognise the cartridges separately, which will smoothen the installation process. Q. I have to replace my Epson XP-235 ink cartridges very soon but I will be travelling so won’t be able to replace them in the near future. Will there be any problem while taking printers? A. The only problem you can face is that the printouts may not be very clear. This happens if the print head is not clean which is due to delay in changing cartridges on time.